The initial impulse behind Crowskin came to me after I saw Haozkla, a family puppet fantasy by Edinburgh University company Pangolin’s Teatime, at the National Student Drama Festival last year. I loved the vivid characterisation that stemmed from their use of Bunraku puppets. Even the most trivial action was theatrically engaging when conjured up by these four foot marvels. The play made me re-evaluate what I believed possible in the world of student drama, Determined to raise my game for my next project with Warwick’s Codpiece Theatre, I wanted to use all the new possibilities Haozkla demonstrated, but with a more adult edge: satirically comic but nonetheless dark and demanding. I’d already worked with ArtSoc’s President Katherine Harding when she helped with design for my production of Doctor Faustus, and we were both keen to get ArtSoc involved in a big theatre project. It would allow the society to work with bigger budgets than usual to create a large-scale objets d’art. In the process they would develop new practical skills, and provide me with the team I needed to realise the aesthetic of the play and building of the puppets. We initially intended to adapt work from Neil Gaiman’s short story collections Smoke and Mirrors and Fragile Things: rich, entertaining slices of fantasy set in ordinary life but shot through with a hint of the macabre. Some of these – A Study in Scarlet, Only the End of the World Again, Shoggoth’s Old Peculiar – overtly referenced the work of early 20th century ‘weird fiction’ writer HP Lovecraft. I already knew that Lovecraft had been a major influence on the aesthetic of most twentieth century fantastic fiction, and endeavoured to read all his most acclaimed stories. I had hoped that they would provide a fallback option if the rights for Gaiman’s short stories were denied, but Katherine and I decided that Lovecraft was more ripe for adaptation than Gaiman, and we settled on using his work as our main source of inspiration. The most consistent feature of Lovecraft’s stories is the discovery of a terrifying, ancient and entirely unconquerable monster by a group of foolhardy scientists and academics: a pulp metaphor for the existential angst Lovecraft felt in the aftermath of the first world war and the theory of relativity. One story working through this paradigm – The Shadow Over Innsmouth – gave us a great base for telling a compelling modern tale. It concerns the visit of a dull antiquarian scholar named Robert Olmstead to the Massachusetts port town of Innsmouth, where he stumbles upon a cult of mutant fish people (the Deep Ones) who attempt to offer him up as a human sacrifice in exchange for their immortality. After a narrow escape, the hero realises that he too is a Deep One, gradually metamorphosizing from human into slimy fishy creature. He resolves to return to Innsmouth and join his people. Originally Shadow was intended as an allegory for the dangers Lovecraft imagined in racial miscegenation, but I believed the narrative could provide a vehicle for a much less paranoid exploration of what sacrificial culture means to the West in the 21st century. Joe Lane. The idea of human sacrifice in exchange for immortality seemed tantalisingly relevant to way society sacrifices its young in warfare to sustain its geopolitical interests. The Vietnam war is the most well-documented and notorious conflict fought by a democratic government with conscription, and provided a rich vein of possibilities for implicitly debating the extent to which young people are currently involved in U.S. adventurism. We also wanted to explore the ways governments make expansionism palpable to voters. Inspired by Adam Curtis’s documentary The Power of Nightmares, we sought out historical models of government propaganda machines engineering phantom threats from foreign regimes and ideologies to justify military conflict. The CIA’s MKULTRA programme from the 1950s and 60s provided a horrific example of how far elected governments will stoop to manipulate the populace. In Canada, CIA-sponsored psychiatrists set up elaborate brainwashing experiments, in which they attempted to turn ordinary people into complacent drones, and induced a host of severe mental illnesses in their subjects. I decided to refract Lovecraft’s mythology through the lens of 1960s culture in order to tap into these examples of historical atrocities. I assembled a team of three writers to work closely with Katherine and I to create a script based both around these concepts and the actors’ improvisations in rehearsals. Before we could begin the devising process, the writers and I needed to come up with a satisfying story structure to support the actors in rehearsals. To reinforce the sense of a period setting we decided to base it on the period’s most prominent fantasy, SF and horror stories. We used reference points as diverse as 2001 and Scooby Doo to construct a new narrative based around Lovecraft’s Deep One mythology, harnessing his human sacrifice ritual as a symbol for the Draft. Although many of the finer details changed when we improvised and workshopped scenes in rehearsal, our basic structure remained very much the guiding light through the rest of the creative process. Our four main protagonists were based on the archetypes of the teenage heroes of Scooby Doo, but filtered through the real culture of the 60s, and reshaped heavily according to the inclinations of the actors playing them. Vietnam did not feature directly because we wanted to make the play an allegory for conscription in many cultures rather than a treatise on that particular war, but it was referenced throughout so that it was the most immediate example of our conscription allegory available to the audience. I worked closely with Katherine to decide on the types of puppetry we could feasibly employ. We decided on a large rod puppet for the leader of the Innsmouth cult (Mr. O), a series of finger and glove puppets to narrate the story of how the town came to be ruled by the Deep Ones, a selection of shadow puppets for a variety of key comic scenes, and a selection of ‘humanettes’ – life-sized moving costumes that would transform the actors into fish men. Katherine appointed three ‘design heads’ to lead small teams in building each puppet type, and gave herself responsibility for leading the ‘humanette’ team. Each group benefited from professional guidance. Katherine’s cousin Tom Aizlewood is a semi-professional stop-motion animator, and family friend Janet Knechtel is an independent puppet maker whose credits include puppets and costumes for almost every Jim Henson film. 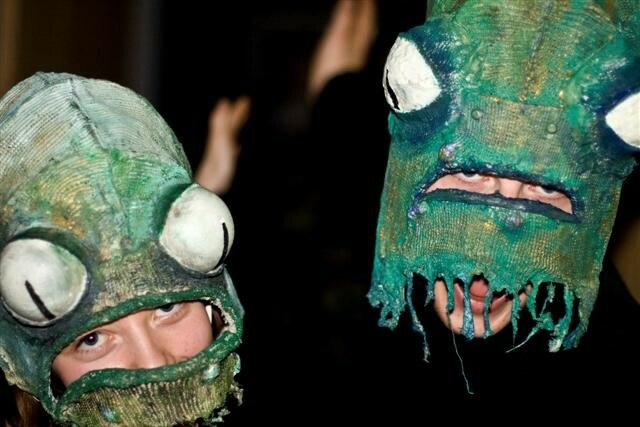 Together they taught the design team the basics of puppetry in two all-day workshops, and we couldn’t have even come close to realising the high standards of puppet work in the play without their help. The Deep Ones invade: Alex Varley-Winter and Tim Franklin. 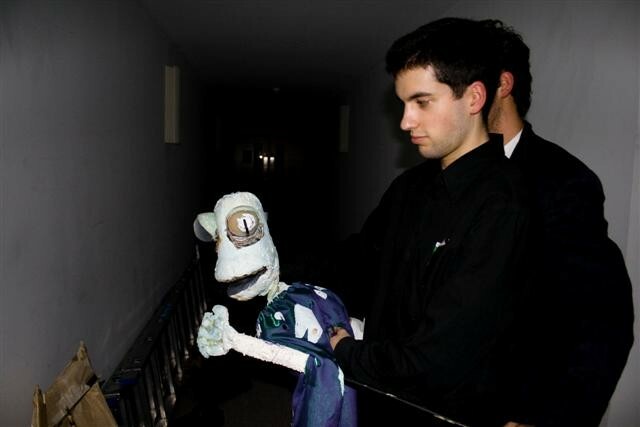 The puppets were gradually introduced into rehearsals as they became useable. The need for other types of puppet also became apparent as we started to flesh out the story by devising. These included, amongst others, a set of living buildings to represent the Innsmouth cityscape, and an origami octopus to stand in for Cthulhu, the monstrous enemy of the Deep Ones. The heads of design took responsibility for these after their original commissions were finished. Since we did not have a script when the design teams began their work, I commissioned each type of puppetry based on my preliminary structural notes. Devising and writing were then shaped around these specifications. In ideal circumstances the devising process would begin ahead of design, allowing design to exactly suit the nature of the emerging production. However, if you are looking to these notes for tips on a similar project and are working in a timeframe as tight as Crowskin’s, my advice is to choose your design specs very carefully beforehand and make them integral to the production to guarantee they don’t become redundant halfway through. I would also recommend leaving some flexibility later in the rehearsal schedule for smaller, additional things that you need to be built, and placing set design as late as possible in the production process. Rehearsals were based initially around character development exercises and improvised versions of the scene ideas we had come up with in the writing meetings. The devising process also allowed new ideas to emerge. Early on, I made up exercises to get the actors thinking about the themes of the play and the culture of the period, and asked them to create short snippets of stylised physical theatre based on these. The most successful of was a representation of the A-bomb falling Hiroshima, and we decide to embed the event into the overall narrative and make the cultural impact of the atomic bomb a recurrent theme in the play. The conflict between the national guilt over the dropping of the A-bomb and the continued justification of America’s nuclear arsenal fit neatly into the existing allegory for the nation’s foreign policy. From left: Karl Niklas, Saskia Roddick, Yann Allsopp, Julian Gyll-Murray, Joe Lane. The structure of the writing process also worked well and ensured that every writer had one scene to write and one to re-write every week. Each writer would use their notes from a particular set of rehearsals to draft a scene, and in a weekly meeting we would criticise each draft and hand it back for re-writing. Alex Varley-Winter was in charge of serious, disquieting scenes, Tim Franklin focused on the voices of the four leads, and Nima Seifi the comic scenes that were disconnected from the main narrative action. Since each knew the overall narrative very well and had a chance to work from performances they were able to see in rehearsal, this was generally successful. Their voices blended together well, and helped the play achieve a fairly consistent tone. However, I would recommend keeping a tight limit on the length of the piece; I failed to appreciate quite how long it takes to rehearse dialogue thoroughly and made Crowskin’s script too long to comfortably polish with the actors in time. Getting the play into a presentable state in time for the first night was therefore tough. I had worked deliberately slowly with the company to make sure that the production felt suitably detailed, but failed to trim back the play as tightly as I originally intended. It ultimately weighed in at over two hours by the first night and we had no time left to reduce it in rehearsal, nor polish up scenes we had begun working on last. For the second performance we pruned back the play considerably, cutting entire scenes when they felt superfluous and cutting sections of dialogue in others. We also added an interval and massively reworked scene transitions, meaning that the play was a far slicker, livelier and more enjoyable experience by the end of the run, and one that everyone involved could feel proud of. It was, however, not perfect: structurally the final act never approached the atmosphere of foreboding horror that I had planned would conclude the play, and I feel that I neglected it in rehearsal in favour of the lighter, more comic first half. The production was also never quite as short as I wanted it to be: some scenes could only be shortened with substantial rewriting, and whilst each was satisfying in its own right, could feel indulgent when run back-to-back. Nonetheless, I’m pleased with the way Crowskin turned out: in the collaboration between ArtSoc and Codpiece Theatre, Katherine and I created a new model for working on student drama which I very much hope proves fruitful for others in the future, and despite structural problems in the second half, I feel Crowskin was a very satisfying piece of grown-up, comic theatre with strong performances across the board and some very cool puppets.